It was probably a bit unfair to go and ski Grouse today after yesterday’s epic Baker trip. But I’m still on vacation, my lungs are finally feeling better, and all I wanted to do was ski. The snow was pretty mediocre. The Peak was cut into enormous bumps, and the runs lower down were icy and chunky. My quad muscles are in hiding after five months of illness, and went into shock when I asked them to ski back-to-back days. At 108 underfoot, the Rockers definitely weren’t going to let me slack off if I actually wanted to carve them on hardpack. Nonetheless, I had fun. 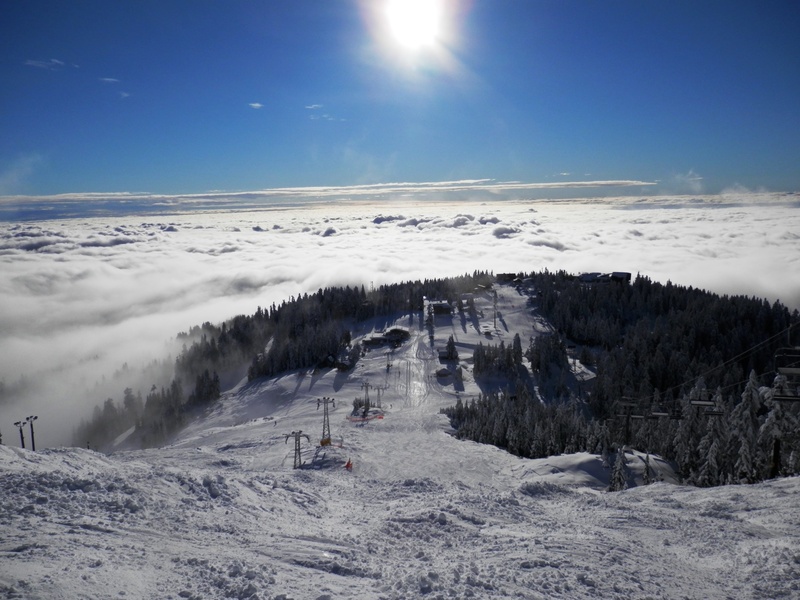 There was a temperature inversion and the top of the mountain basked in blue skies high above the clouds that blanketed the city. 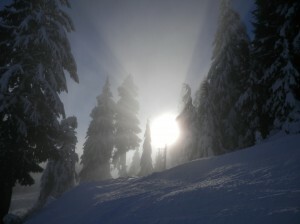 Fog drifted in and out of the lower runs, catching sunbeams and casting strange shadows amid the trees. I caught a couple of first runs on newly opened areas, including some sun-warmed powder on Tyee Chute and awkward bouncing over old iced-over tracks somewhere above the Olympic Chair. When my quads eventually flaked out, I headed down. Beneath the cloud it was a typical grey, gloomy Vancouver winter’s day: a world away from the sunshine and snow high up on the mountain. It wasn’t the greatest day on skis, but I’m glad I made it out. This entry was posted in Grouse Mountain, Skiing on December 12, 2012 by Kay.